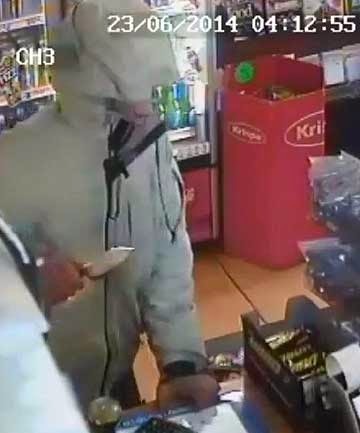 "Pepper spray sends knifeman fleeing"
Footage shows a man entering a Christchurch dairy before pointing a knife at the shopkeeper in a robbery. A Christchurch dairy owner scared off a knife-welding robber by threatening him with a can of pepper spray. She also had a pool cue behind the door if she needed it. Police have this week renewed calls for public assistance to identify the hooded perpetrator, who fled as soon as she held up the spray can. But they warn dairy owners have few legal grounds to justify arming themselves. Security footage of the June 23 incident at Avenues Dairy, on the corner of Worcester St and Fitzgerald Ave, shows the hooded man walk into the dairy and put a can of beer on the counter. He requests cigarettes, and the dairy owner asks him for ID. The man then pulled out a large knife, which Detective Hamish Beer said "has that cheese knife look about it". The female attendant responds by grabbing a can and holding it up. Beer would not comment on what it was, but a visit to the dairy found it was a can of pepper spray, which the small, friendly woman, still had handy, but out of a customer's reach. She did not need to spray the offender that day. She just held it up and he ran, she said. The dairy had been robbed only a month earlier, when two intruders, one holding a knife, threatened the female shop attendant, demanding cash and cigarettes. She called out to an associate, and they fled empty-handed. She is not the only city dairy owner taking matters into her own hands. In June, a Yaldhurst dairy owner wrested an air rifle off robber who demanded cash and tobacco pouches. Alexander William Edward Cottrell, 17, ran off empty-handed. In October, another dairy owner fended off knife-welding robber Carly Denise Laughton, 27, with a chair. She was jailed in March after confessing to the robbery. Detective Senior Sergeant Mark Warner said dairy owners could justify arming themselves only if they had recently been robbed and feared it might happen again. Otherwise, they risked prosecution for possessing a restricted or offensive weapon, he said. Whether or not a dairy owner would face charges for fending off a robber with a weapon would be assessed on a "case by case basis", he said. Dairy owners should instead consider security measures such as automatic doors and panic buttons, Warner said, but he conceded these came at a cost. Offenders had little to gain for robbing dairies. They often left with nothing or "very little", yet police and the judiciary took the offence "very seriously", Warner said. Anyone with information on the June 23, Avenues Dairy robbery was asked to phone Detective Beer on (03) 363 7400.